For-profit universities represent one of the fastest growing industries in the United States1, with annual growth projected at around 20%. Selling points to students include flexible schedules and superior career placement services. Many for-profit universities are purchasing portions of bankrupt colleges as a means of acquiring both expanded facilities and regional accreditation. 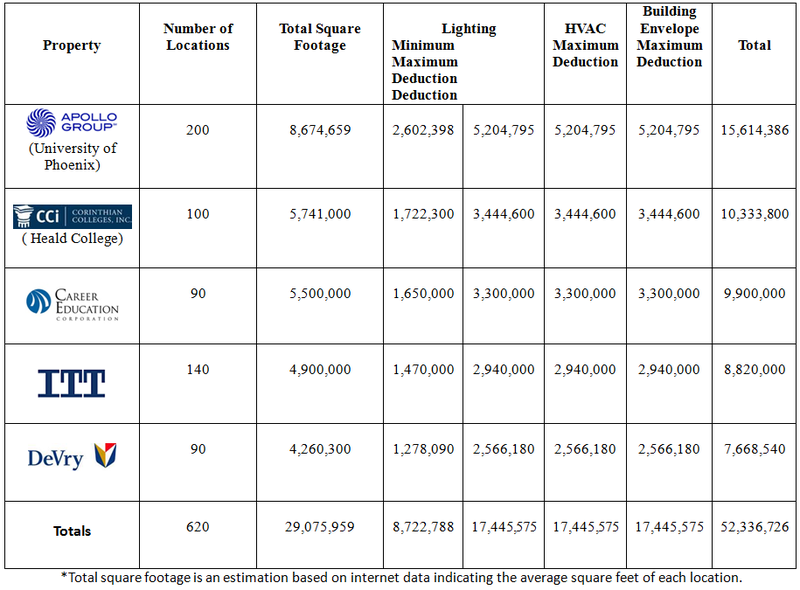 The buildings involved in these transactions are prime candidates for energy efficient renovations such as reduced energy efficient lighting and energy efficient HVAC. Pursuant to Energy Policy Act (EPAct) Section 179D, buildings making qualifying energy-reducing investments in their new or existing locations can obtain immediate tax deductions of up to $1.80 per square foot. Many for-profit universities seek regional accreditation to enhance their academic status and to allow students to transfer their credits more readily. The quickest way to achieve accreditation is to buy it. In 2009, for example, Educational Services Inc. purchased debt-ridden Daniel Webster College, receiving its regional accreditation in the New Hampshire area. Debt-ridden organizations often fail to properly maintain and update buildings in order to reduce expenses. Therefore, the buildings acquired by for-profit universities will need extensive improvements, including energy-reducing investments. Educational opportunities now exist throughout the calendar year, including summer and winter interims. Occupancy at peak temperature months requires efficient HVAC whereas many older lecture halls lack such systems entirely. New facilities are adding energy efficient HVAC systems to control the temperature and air handling, including carbon dioxide levels and air turnover. These HVAC units also control motor speeds for multiple motors. Many such improvements are strong candidates for EPAct incentives. Long life, low wattage LED lighting is now a viable alternative for college facilities, where lighting constitutes a major source of energy use. LED lighting lasts forty times longer than traditional technologies and uses one-tenth the electricity that today's incandescent light bulbs use. LED lighting not only reduces energy consumption and green house gases but also allows for-profit institutions to receive EPAct tax reductions2. Combined energy efficient HVAC and LED lighting upgrades maximize EPAct potential. Conserving energy and protecting the environment is a good policy on its own and one that attracts environmentally conscious students. Apollo Group has a “Lighting Controls” policy that equip data centers with motion detection systems to eliminate non-emergency lighting during periods of high human occupancy. University of Phoenix recently celebrated the grand opening of its first LEED gold campus. This LEED campus includes an energy-efficient HVAC system, large windows to reduce the electricity load during the day and low mercury lamps. LEED buildings are especially well-positioned for large EPAct tax incentives3. Coursera is a free online education program that has enlisted leading colleges including Columbia University, University of Florida, Stanford University, and thirty other partners. It offers 200 courses and has enrolled 1.3 million users. Once the sole dominion of the for-profits, online education is now another competitive battleground between for-profit universities and traditional schools. Competition will drive both technological innovation within this space and will also exert downward pressure on pricing. Reducing building operating costs while utilizing EPAct tax incentives can help for-profit universities compete with its new online competitors. For-profit universities have become popular choice among students in recent years due to their economical, flexible, and wide-ranging courses. These universities have adopted many attractive features including regional accreditation, online courses, and eco-friendly campuses. Many schools are "going green" in an effort to create a more dynamic learning environment. LEED campuses achieve large savings on their water, electricity, and HVAC bills which result in an additional tax benefit. Students know the importance of a future investment, whether towards their education or environment. Rachelle Arum is a Tax Analyst with Energy Tax Savers, Inc.